Kim has all the directions laid out for you for making this bunny. I changed up a couple things here and there on the card. A small challenge though……making Easter eggs! 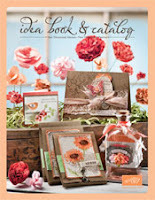 Maybe Stampin Up! could come up with a punch….hint hint! I know there is a couple of stamps, but they were too small or too large. The Fancy Flower punch came in handy with the flower base from the Sweetheart stamp set. Popped the flower, grass, eggs and bunny up with dimensionals, added a button and I was done! I was able to use a lot of my accents pieces (stickers) from the Ice Cream Parlor DSP on the inside. They flowed very nicely with the same DSP I used on the front of the card. Awww! What a cute bunny! So sweet, Linda!